Performance information, sound files, and any forms regarding JSD All-District and Utah State Honor Ensembles for this school year can be found on this page. Go to the UMEA website to find audition materials and more information regarding the Utah All-State Jazz and Concert Band audition information. This year, nominations are collected and accepted for the JSD All-District Band, and are different as the Utah All state Band. Speak to your directors if interested - click here for audition materials. Do not use the existing pdf files below. Students who are nominated for the ensemble will pay a $40 fee to participate which includes dinner both rehearsal days, and pays for our guest University conductor. 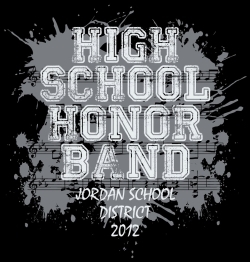 Make checks out to 'Jordan District Honor Band' or pay cash in your school's Main Office. 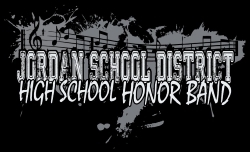 Sample recordings for the 2018 JSDHS Honor Band selections will be available for download below once the program is set. After the concert, these will be replaced by the actual concert recordings and participating members can download their own copy of the concert. There is also a possibility that the concert will be live streamed online. All rehearsals, dates, information, and audition materials can be seen by clicking on the GREEN button on the UMEA website. Audition Leadsheets, Etudes, Play-along recordings, etc are found when you click the GREEN button. Please see specific requirements but in general students will play the melody, an etude, and will improvise to “Autumn Leaves” along with a recording. Lead Trumpet, Bass Trombone and the Rhythm Section will have some additional requirements. The audition materials for this year are from the Maine Music Educators Association and are used by permission.